What Are Zombies? - A Gods-and-Monsters exclusive report. You know what I find really interesting about zombies? Unlike almost all of their monster contemporaries, they are the only ones who are believed to be entirely fictional. And I'm talking about the undead, flesh-eating types, not the mind-controlled voodoo ones. Nobody claims to have seen a zombie shuffling through the woods or has had investigators checking out zombie tracks from an alleged attack the night before. There simply aren't sightings like there are for werewolves, vampires, or the Jersey Devil. Zombies are entirely fictional creatures, at least for the moment. But these mindless flesh-eaters hold another unique position in the monster world. Functionally, they serve less as a 'scary monster' than they do as a herald for the end of the world. Whenever a story features zombies, it's almost always in an apocalyptic context. Like vampires and werewolves, humans can become zombies from a transfer of bodily fluids, but unlike vampires and werewolves, few people actually think it would be cool to be turned into a zombie. At least the other two monsters at least appear to be somewhat human, but zombies are essentially mindless freaks whose very existence signifies the potential end of humanity at large. A 'zombie apocalypse' (a catastrophic event where humans are unwillingly turned into zombies on a massive scale) is largely considered a type of plague, which is why many modern storytellers choose the incursion of a biological virus to introduce this plague into the populous. This isn't necessarily true for the reanimated types though. Those brought back from the dead, with their rotting flesh and lumbering gait can be pulled from a cemetery for a night to terrorize the local community before heading back under ground. In addition, the original "zombi" actually comes from Haitian Voodoo folklore, where the afflicted individuals were not dead at all, but rather possessed by sorcery. These key differences between varied mythologies make it difficult to find a single 'truth' to follow. Though it is difficult to come up with a single definition of what makes a proper zombie, there are enough commonalities between the core mythologies to fashion a fairly simple description. First things first, zombies don't think for themselves. Whether they are consumed by rage, a mind-controlling disease or magic spell, or are simply too dead to reason anymore, a proper zombie cannot think for itself. This is what makes them so scary - there is no reasoning with them, no cure for their infection, they don't get tired, and they don't stop coming at you, no matter what. Some (particularly more modern) writers have tried to change things up by creating zombies that reason, strategize, and even lead others. In my opinion, this is where I have to draw the line. It is no longer a zombie if it can think for itself or reason between any options on a higher level than instinct alone. You now have a weird, crazy, possibly undead person - not a zombie. Secondly, a zombie's only real instinct is to feed off of living flesh. At this point we have to separate out the Haitian zombi (which I will from hereon only refer to as a 'zombi'), as these are essentially people whose minds are being controlled by a living person (magical though they may be). A 'zombie', whether the living dead type or the disease-induced rage type, wants only to kill and to feed, and like a snobby food critic - only wants the freshest ingredients. I'm not so concerned if one particular mythology describes their walking dead as simply wanting to take a bite out of you, literally eating as much of you as possible, or is picky enough to only want to eat brains. It's all basically the same thing - feed on the living, the smarter the better. At this point it seems fair to be able to split the remaining zombies into two categories - the fast ones and the slow ones. Again, different mythologies have different definitions, but in our quest to define a "singular truth", provided below is how I would define the two primary types. You start with a human being. That human being is infected with a virus that causes them to lose all control. They become mindless, rage-filled death machines looking only to kill and feed. They are not unlike a transformed werewolf in this way. This 'fast zombie' is essentially like a diseased PCP addict on a rampage, except they seek out 'normal' people to devour for food. The hunger is what drives them. As with any virus, it looks to spread. Essentially the virus overtakes the human's mind and begins controlling it, driving the infected to spread this virus through saliva and blood transmission. Unlike werewolves or vampires, the bite of a zombie is dangerous in that it contains a virus, rather than a bacteria. The virus takes over the victim's mind, and it's primary concern is to spread. This is why zombies do not attack one another. There is no need to infect someone who is already infected. The virus is smart. It knows this already. So the zombie looks to bite, or to spit blood or saliva on a victim. Both the blood and saliva of a zombie are teeming with the virus. The animal part of the creature looks to feed, and so it often tries to eat its victim, which displeases the virus. But what can it do? A feeding zombie lives to infect again another day. The virus is patient that way. It understands. 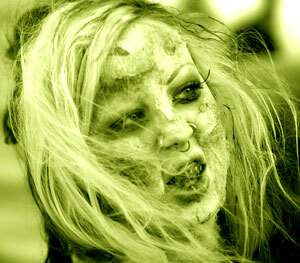 Slow zombies are essentially the "living dead" or "walking dead". They are the re-animated bodies of dead people and their goal is primarily to feed on living flesh. The idea here is that their bodies are dead and rotting away and the only way to keep them 'alive' is by consuming living flesh. Think of it like how a living person can cut himself and have the wound heal over time. Our bodies are constantly regenerating new cells to replace dead or damaged cells, so it makes sense that zombies would seek this regenerative flesh in order to at least partially restore dead cells in their own bodies. The slow ones in particular seem to favor brains, possibly because the human brain has significantly stronger regenerative power for the undead than the rest of the body. How they are re-animated happens in two primary ways. Like fast zombies, a human can become infected through the transmission of a virus via an exchange of bodily fluids. Unlike their faster counterparts, the victim usually dies before the body becomes reborn as a zombie. They are truly just dead people walking around and looking for living flesh to feed off of. One could create an army of the walking dead using only a virus, but this type of zombie also seems to reconnect with the original Haitian "zombi", where the creatures can be controlled through some form of black magic. The only real difference between this type of slow zombie and the Haitian "zombi" is that the slow zombie is indeed dead, while the Haitian zombi may still be a living person. Return from Zombies to the List of Mythical Creatures.